When you think about it, the workday lunch is actually one of the most consistent meals. You're in the same place everyday around lunchtime, and chances are, you've already exhausted almost all your take-out, delivery, and quick lunch options nearby. However, if you work Downtown, the lunch options abound, catering to all the worker-bees in finance, banking, law, the wholesale fashion and jewelry sector, and more. But sometimes, it seems like options are either a super quick bite at a typical café (or worse, fast food joint), or a full, serious sit-down lunch at a grand spot like Bottega Louie. Finding that middle-ground of a quick sit-down lunch that is of a certain quality, delicious, and not super expensive is often a much more difficult task in these parts. 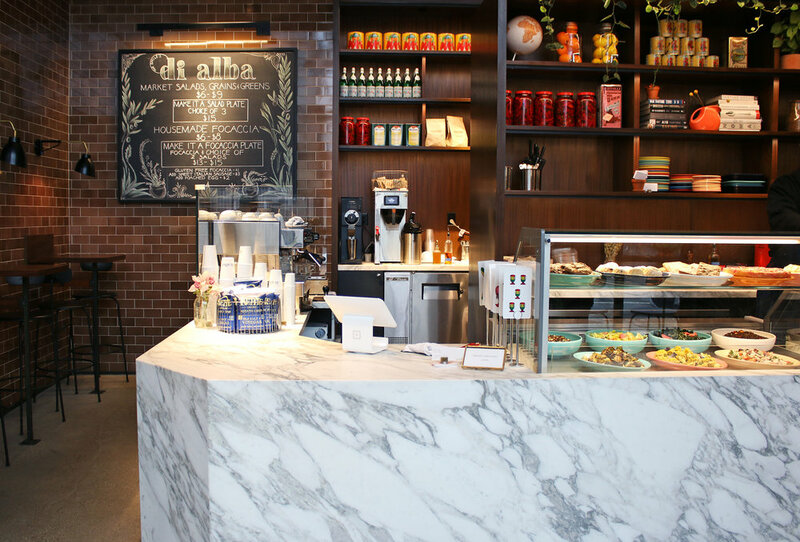 But we've found 2 spots Downtown, Di Alba in the Arts District and Cento Pasta Bar, that perfectly fit the bill and are guaranteed to brighten your day with their boast-worthy bites. A new focacceria and market dangerously situated next to the Arts District outpost of Salt & Straw (I certainly don't need another excuse to have their ice cream), Di Alba is the first West Coast restaurant from partners Matt Kliegman, Carlos Quirarte, and Melia Marden of New York City's popular The Smile and Smile To Go. 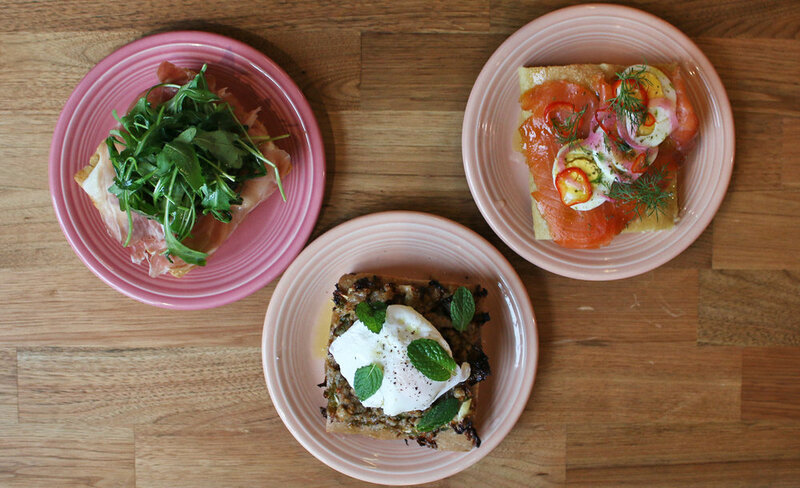 The casual to-go spot also shares a space with the beautifully modern Shinola store and boasts a similar lunch model to the now ubiquitous Lemonade, except with a smaller, more focused menu of daily market salads and focaccia flatbreads. 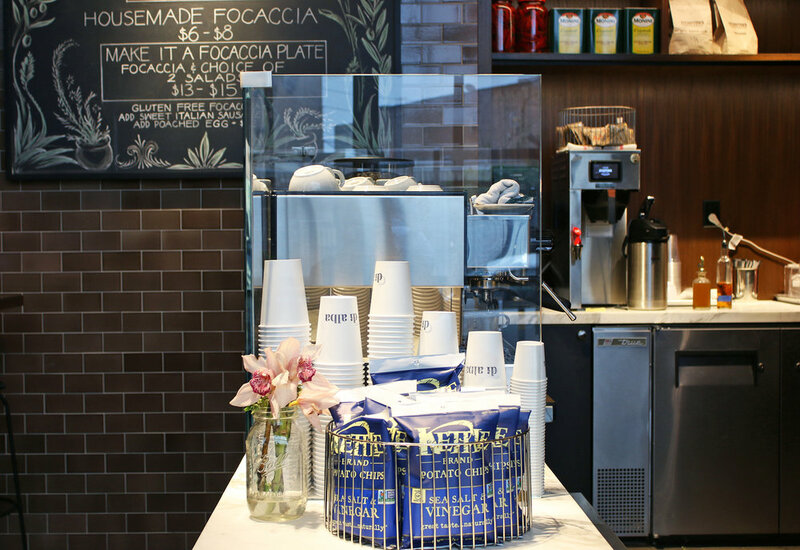 The design is beautiful, modern, and sleek, but brown accents and shelves of Italian ingredients lend it a classic market feel. 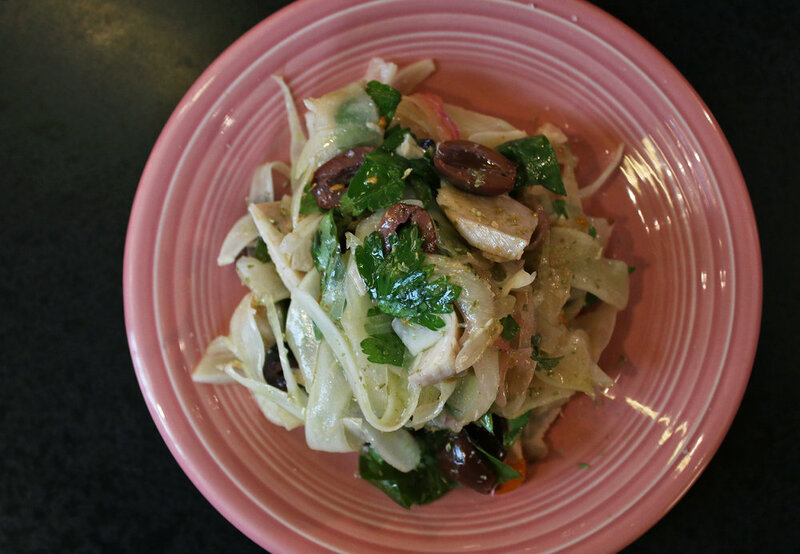 We stopped in for lunch on a rainy day and were immediately impressed by the fresh ingredients, fluffy focaccias, and well-composed salads. A few favorites included the Focaccia Flatbread with Brussels Sprouts, Sausage, and Poached Egg (pictured above), which rendered the ever-popular brussels sprouts in a new, creative way by using them as a base for sausage and a poached egg, on top a soft, flavorful wheat focaccia. It was a light but very satisfying and filling bite. 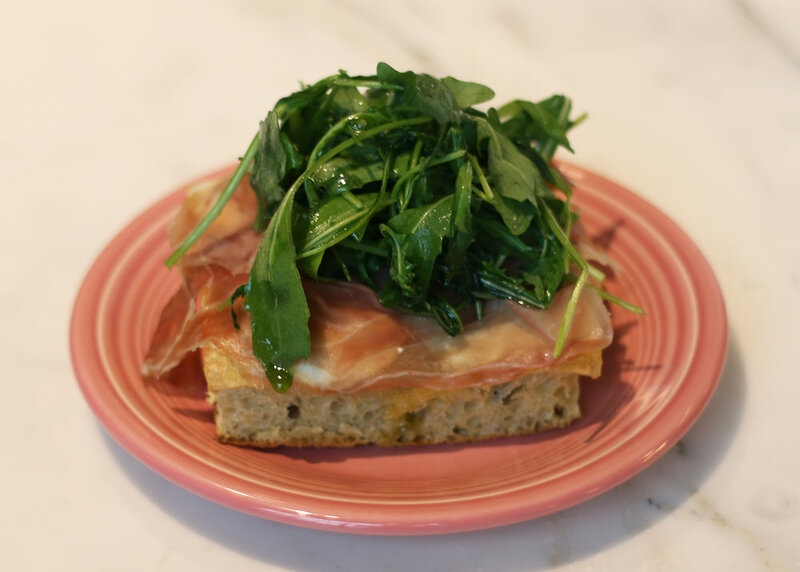 The burrata and proscuitto flatbread was another favorite, with another thick but fluffy bread, thin strips of meaty proscuitto, and creamy burrata to tie it all together. The fresh salads were lovely too, like a kale and watermelon radish combination that was fresh, healthy, and tasty with added slivers of fennel. For a sweet follow-up, the dairy free lemon bundt was a light, moist treat. 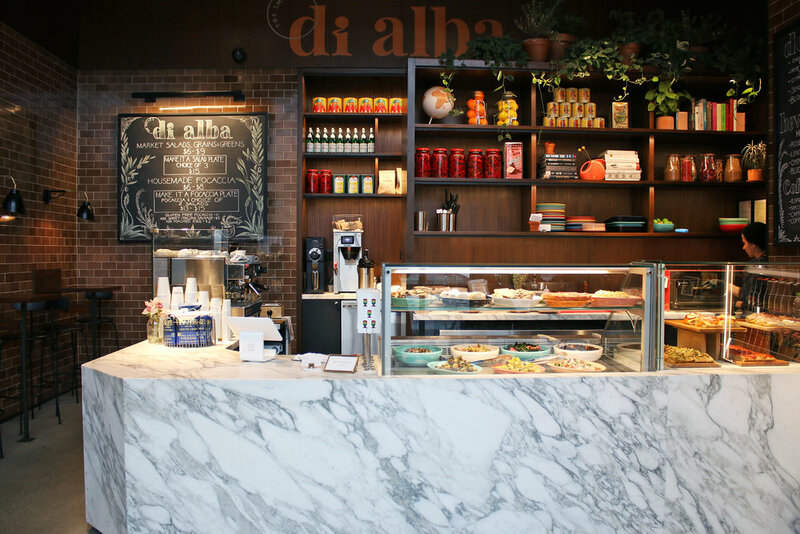 A perfect spot to dip in for a quick, delicious bite, Di Alba seems like a surefire neighborhood lunch staple. 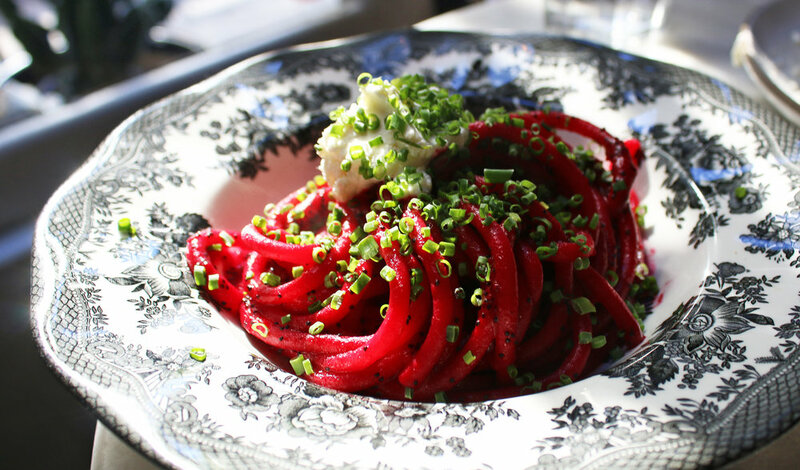 Self-described as a "homemade pasta lunch residency" at Mignon Wine Bar on 6th Street and Los Angeles, Cento Pasta Bar serves up fresh pastas and satisfying appetizers off a small menu that changes weekly. The crackling sound of cast-iron skillets combines with the intoxicating smell of hot, buttery pasta to make you immediately upon entering feel hungry and yet oddly comforted-- bringing back memories of a close family member cooking you a homemade meal while home sick. An intimate bar wraps all the way around the middle of the restaurant, enclosing the chefs, and two small tables sit off to the side next to the door. The few people working inform you of the weekly menu, which usually consists of around 3 homemade pastas and a few appetizers. Everything sounds incredibly appetizing. 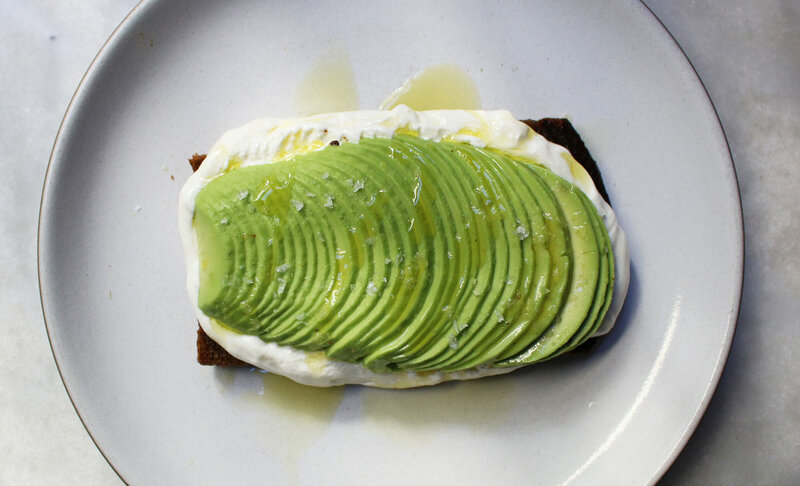 On the week we came in, we were lucky enough to start off with a wonderful avocado toast; eschewing the typical model for something richer and more decadent, theirs is on a buttery, crispy toast with whipped (I want to say ricotta? ), sea salt, and a hint of truffle oil. Luxurious, yet simple, and incredibly tasty. 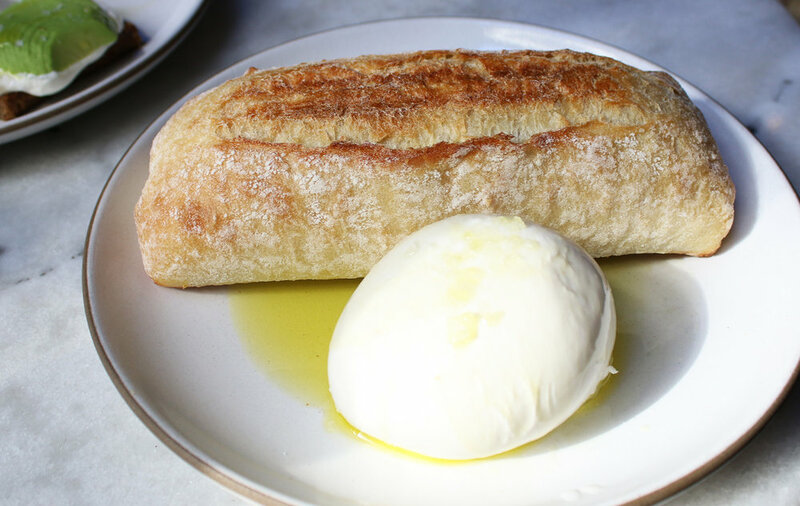 Their house bread was fluffy and crispy, and absolutely addicting when paired with a generous slab of creamy burrata. For the pastas, a favorite was the crab pasta-- thick, homemade noodles added some chew, while the crab was rich and very flavorful. Another simple but decadent preparation. 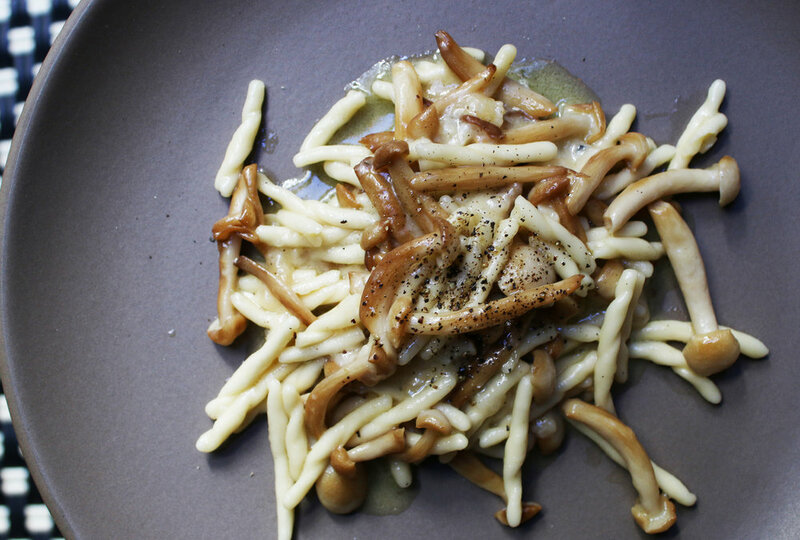 We were also treated to a mushroom fusilli, that again featured thick, homemade noodles that immediately made the dish very substantive. Mushrooms automatically added a rich umami flavor, while the truffle oil (though maybe a bit heavy handed here), topped it off. Overall, it was actually quite a quick and easy experience, but incredibly comforting and delicious. Another ideal place to stop in on a cold day (or if you're having a rough week of work) for a comforting bowl of simple, but sinful pasta.